Timespan’s regular film club launches with a double bill from the artist Uriel Orlow. 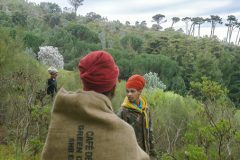 Join us fer a poke of popcorn and two short films which look at traditional herbal practices in South Africa through the lens of its colonial history. Muthi follows enduring herbal practices at rural and urban sites in Johannesburg, the Western Cape and Kwazulu- Natal, showing chains of value and practice which include plant collectors, traders, traditional healers, local communities and users. Together these touch on larger issues around erasure and continuity, tradition and modernity, indigenous knowledge and alternative medicine in post-colonial contexts. Uriel Orlow’s practice is research-based, process-oriented and multi-disciplinary including film, photography, drawing and sound. He is known for single screen film works, lecture performances and modular, multi-media installations that focus on specific locations and micro-histories and bring different image-regimes and narrative modes into correspondence. His work is concerned with spatial manifestations of memory, blind spots of representation and forms of haunting.